Supermarine Spitfire Mark VB, BM590 'AV-R' "Olga", of No. 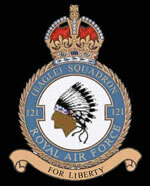 121 Squadron RAF based at Debden, Essex, in flight. 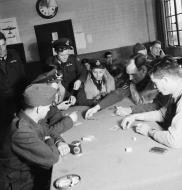 Flying Officer K M Osbourne shares his experience of a 'dog fight' with his Commanding Officer, Squadron Leader W B Williams DFC and other members of the Eagle Squadron, following a fighter sweep. 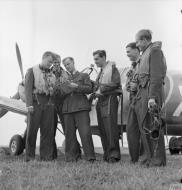 Left to right, they are: Flight Sergeant Bill Kelly, Flight Sergeant Sanders, Pilot Officer Don A Young, Flying Officer K M Osbourne, Squadron Leader W B Williams DFC, Pilot Officer Cadman Padget, three unidentified personnel, Pilot Officer F R Boyles, Flight Lieutenant Seldon R Edner (just visible), Flight Lieutenant Jim Daly DFC, Pilot Officer Jim Happel, and Flying Officer Barry Mahon. American volunteer pilots of No.121 (Eagle) Squadron run to their aircraft at RAF Rochford in Essex, August 1942. Flying Officer Barry Mahon (left) and Flight Lieutenant Seldon R Edner run to their aircraft as they are given the order to scramble. Both men are from California. 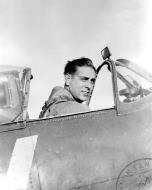 The original caption states that enemy aircraft had appeared at 25,000 feet, seven miles south of the station, hence the need for action. 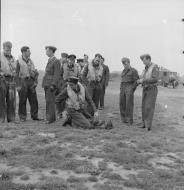 Men of No 121 (Eagle) Squadron stand and wait for their call to action on the grass at Rochford airfield. 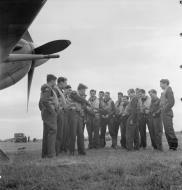 Left to right they are: Flying Officer K M Osbourne, Squadron Leader W B Williams DFC (the Commanding Officer), an unidentified English officer of the ground staff, Pilot Officer Don A Young, Pilot Officer Frank R Boyles, an unidentified squadron member, Flight Lieutenant Seldon R Edner, Flight Sergeant Jim Sanders, an unidentified squadron member, Pilot Officer Jim Happel and another unidentified squadron member, possibly Flight Officer Hasey. 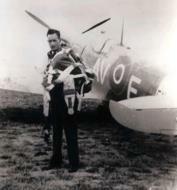 In the foreground, Pilot Officer Cadman Padget plays with the squadron mascot, a dog named Roger. 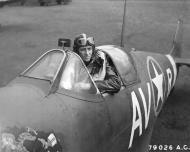 American volunteers, Flight Sergeant Bill Kelly (left) and Flying Officer Osbourne of No. 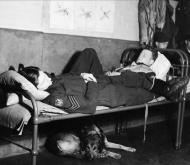 121 (Eagle) Squadron, RAF, at rest in the Dispersal Hut at Rochford airfield in Essex during 1942.Flight Sergeant Bill Kelly (left) and Flying Officer Osbourne sleep between 'sweeps' in the Dispersal Hut at Rochford airfield. Underneath the bed on which they sleep is the station mascot, a dog called Roger. The original caption states that "Like so many of the fighter squadron mascots, Roger belonged to a pilot since reported missing, and has been adopted by the others". Flying Officer Osbourne plays a tune on his banjulele as entertainment for his Eagle Squadron colleagues on the terrace of the old English house in which they are billeted. 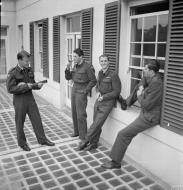 Left to right, the 'audience' is: Pilot Officer Kearney (smoking a pipe), Pilot Officer Slater and Pilot Officer Padget (seated on the window sill). 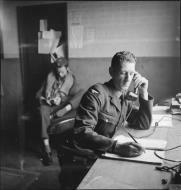 In the Dispersal Hut at Rochford airfield, the telephonist logs a call from the Control Tower, confirming that 12 Spitfires are successfully airborne. In the background, a 'spare' pilot reads a book. Personnel of No 121 (Eagle) Squadron look on as three Spitfire Vbs come in to land after a fighter sweep over northern France. Some of the accommodation used by the Squadron is visible in the background, as are several civilian houses. Also visible are two Royal Air Force vehicles.Personnel of No.121 (Eagle) Squadron look on as three Spitfire Vbs come in to land at RAF Rochford in Essex, after a fighter sweep over northern France during August 1942.